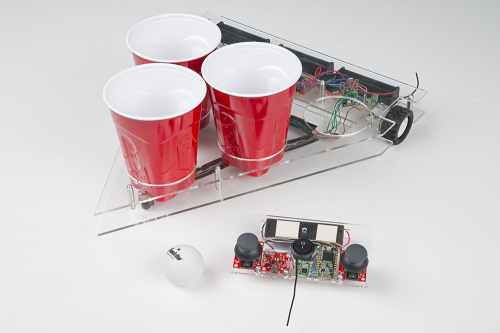 For decades Beer Pong has been played the same way; two teams stand on opposite ends of a table and take turns throwing ping pong balls into cups on the other side. The game is so popular, there are even arcade machines that let you play on your own to your heart's content ... or until you run out of quarters. Whether you play with friends at a party or on your own, the game hasn't changed much ... until now. You can find the most recent laser cutter files and code on GitHub here. Alex - Love this! Great job!! Thank you! Project turned out better than I expected. Won't this go flying off the table after a few rounds and the players no longer have fine motor skills? How does one build this when it needs 4 (PRT-12895) batteries yet we are only allowed to purchase 2? Sigh. More than 1 order or local pickup. Check out this blog post on the details, but shipping Lipos is tricky and doing more than 2 per package is tricky enough that it is beyond our ability to do at the moment. very nice. On the robot when you connect your "red bot sensor" together, you can twist the wires together with a drill so it makes the wires harness more cleaner since we see it through the transparent plastic. That's typically my go to method for making a wire harness. When I first made it though, I was just in a rush to get it done. Congrats! You actually managed to make this game fun and entertaining!! !